Ever since I met my wife, all of my Holy Week vacations are spent in Pangil, Laguna. 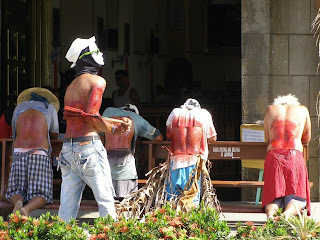 Aside from the Good Friday procession, one of the highlights would be watching men performing "penitensya" as part of their "panata" or "religious vow" which they promised to keep in exchange for an answered prayer, like healing from sickness of a loved one, passing the board exam, getting the dream job, etc. What's ironic though is that although my wife wants to stay in Pangil during the Holy Week, she is still afraid of the penitensya (or what the locals call the people performing the ritual), a fear she had when she was still young. She said she isn't afraid of the flagellants (person performing penitensya or self-infliction of wound by whipping), but rather of being hit by blood splatter or because of the odor of fresh blood. When I was young, I remember seeing these penitensya in Malibay, Pasay. But I doubt that there are still men practicing that ritual there. I guess most of these are now only being practiced in a few parts of the city but mostly in the provinces. Even before sunrise of Maundy Thursday, one can already hear the sound of the wooden tipped or chain whips as these flagellants walk through the streets of Pangil. The penitensya ends just right after the evening procession on Good Friday. Today, some penitensyas wear masks instead of a cloth around their face to hide their identity, while others just wear sunglasses, and still others just walk with their face exposed. Maybe one of the reasons why some kids are afraid of the penitensyas is because of how they look like while walking through the streets. Meron pala niyan sa Pangil. My daughter's been nagging me about going to CUtud, Pampanga where the penitents even allow themselves to be nailed to the cross. Ako ang umaayaw. Hehehe. Fortunately or unfortunately meron pa ring penitensya although parang kumokonti na sha unlike before. Ako din, ayaw kong mapalapit sa nagpepenitensya! I experienced being splattered with blood while watching those "penitensya" decades back in Naga City. I was even wearing white blouse. I can relate how your wife feels. it's a vanishing ritual. maraming places na merong nagpe penitensya before ay wala na ngayon. dapat siguro ay ma document ito for posterity. Dumaguete's Sans Rival: Without Rival?